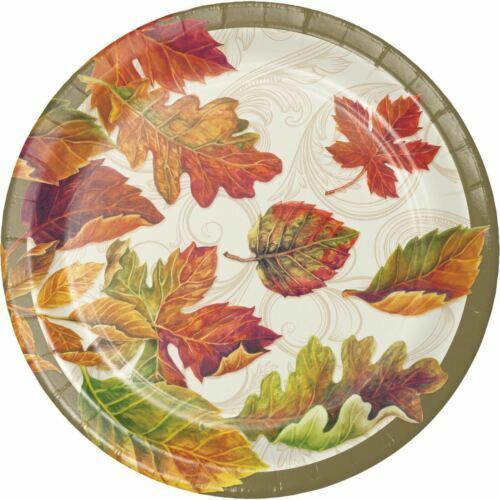 Colors of the Wind Colorful autumn leaves blow in the wind against a background of golden scrolls on off-white on this lovely and elegant tableware. Accent with coordinating solid colors of Pumpkin Spice and Glittering Gold. 7 inch Dessert Cake Sturdy Style Premium Strength Paper Plates (8 ct) Paper/Plastic Tableware is meant to be one use and disposable. Check out our other party supplies in Thanksgiving Themes!